CPS is no different than the slave masters who auctioned off African children to different plantations, separating African children from our mothers and fathers. By now, you’ve probably heard the tragic story of the six African children who were murdered by their adoptive white female parents when the women drove their car off of a cliff into the sea. 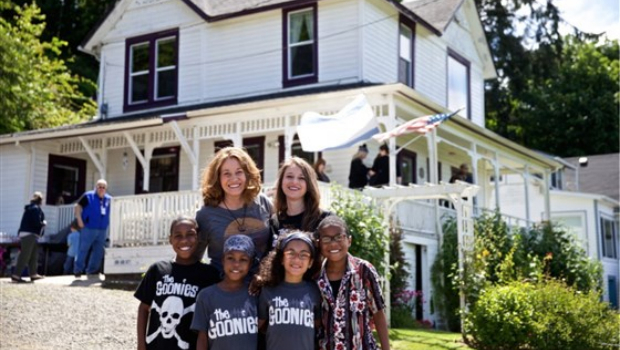 The two white murderers were Sarah and Jennifer Hart, the adoptive parents to Devonte (15), Abigail (14), Hannah (16), Jeremiah (14), Markis (19), and Sierra (12). The women, along with the bodies of the three older children, were found floating in the water near the car while the other three children remain missing. Among the missing children is Devonte Hart. Devonte Hart was the young boy photographed tearfully hugging a white cop in the aftermath of Mike Brown’s murder and the acquittal of white cop, Darren Wilson in Ferguson, Missouri in 2014. The cop Devonte was hugging was sergeant Bret Barnum. Barnum was the source of controversy when he came out in support of Darren Wilson on Facebook. The more details that come out about this incident, the more it becomes clear that this is another example of how Child Protective Services (CPS) does not care about the welfare of African children. CPS had been called before on the Harts. The children were vocal about the fact that they were starved and abused, yet nothing was done. In the weeks leading up to the murders, the neighbors had contacted CPS because Devonte and his siblings had taken to begging them for food and on one occasion, Devonte’s sister Hannah showed up at the neighbors’ house with missing teeth, claiming she was being abused. The Harts had CPS cases opened on them in three different states─Minnesota, Oregon, and California, but the children remained in their care and they were allowed to move from state to state freely. In 2011, Sarah Hart plead guilty to domestic assault when teachers found bruises on the girl’s body. She was given a slap on the wrist, one year probation and a suspended 90 day jail sentence. This is completely unethical and a testament to the carelessness with which the lives of African children are treated. Despite proof of the abuse going on in the Hart home, CPS did nothing to ensure that these African children were removed from harm’s way and their white abusers held accountable. Contrast this with the case of Maisha Bright (Baltimore), an African mother whose children were removed in 2013, after false unsubstantiated allegations of abuse were made. Maisha still does not have custody of her now teenaged children, even though she has been fighting back. The State, however, continues to keep them from her. Compare this case also to mother Nina Ford (Baltimore), who lost custody of her child as she was struggling to make ends meet. While she did the best she could, the tate deepened her crisis by blocking access to the programs that would have kept her child with her. In a twist, Nina was charged with felony kidnapping when she rescued her child from a dangerous situation while the child was still in the custody of the CPS appointed caretaker. It is not uncommon for working-class Africans to be in situations like these and have their children taken for any small or unsubstantiated claims. It is also not uncommon for these kidnapped children to then be placed in abusive homes. Statistically, children are more likely to be physically abused when taken away from their families according to Richard Wexler, of the National Coalition for Child Protection Reform. Instead, children are shuffled around and in some cases, ultimately end up dead or in far worse situations than if they were left with their families. White children are the least likely to be monitored by CPS and African children make up more than two-fifths (or 40 percent) of the foster care population, despite the fact they make up less than one fifth of children in the United States. For example, in Chicago the percentage of African kids in foster care is 95 percent. In 2008 a young African girl from Ethiopia, named Hana, was murdered by her white adoptive parents, Larry and Carri Williams, two Washington natives. In this case, a child was stolen from Africa and then murdered because of the so called “biblical beliefs” of the Williamses. This is kidnapping and genocide! Instead of providing help to poor working-class families so that they may effectively raise their children, the State villainizes them, arrests them, and kidnaps their children. In many cases, the parents and children are never reunited, effectively breaking up the household. Recently, here in Detroit, a young African mother who had just given birth was told, falsely, that if she did not take the Depo Provera shot she would not be allowed to take her newborn home. It goes without saying that newborns belong with their mothers; they need milk and they need to bond. All the African women I’ve mentioned were overcriminalized by the State and had their children taken from them, whereas the Harts, who portrayed “harmless,” liberal, white women lifestyles, were clearly a danger to their adopted children and no one did anything to help them. Everyone failed them, including the system that purports to deal in the welfare of children. This is why the African National Women’s Organization (ANWO) has started the ArrestCPS campaign. No longer can we sit by and allow the State to get a hold of our children. We are African mothers who charge DHS, CPS, and the family court system with the kidnapping and genocide of African working-class children. African mothers, like Maisha Bright, whose children were removed for false unsubstantiated allegations, and Samantha Johnson, who after trying desperately to get help to pay for expensive medication for her young daughter, ended up having her daughter removed from her home because she was seen as unfit to take care of her, are why we must fight the State. This cannot stand. The state should not be able to remove children from loving homes only to be bounced around with no stability or being placed where they will likely be abused or killed. Devonte is still missing but is presumed to be dead. As a mother of an African boy I mourn his death, but I also see it as a call to arms. We must fight for our children; indeed it does take a village to raise a child up. We need to rally and protect our children from the State. The states of Minnesota, Oregon and California should pay reparations to the families of all six murdered African children and criminal charges should be forthcoming to begin the break up of this kidnapping, conspiratorial criminal organization called Child Protective Services. BUILD THE AFRICAN NATIONAL WOMEN’S ORGANIZATION!